BrdU Cell Proliferation Assay Kit | K306 | BioVision, Inc. Detection and quantification of cell proliferation induced by growth factors, cytokines, mitogens, and nutrients. Analysis of cytotoxic and cytostatic compounds such as anticancer drugs, toxic agents and other pharmaceuticals. Determination of the inhibitory or stimulatory effects of various compounds on cell proliferation. • Highly-sensitive: detect as low as 50-100 proliferating cells. 5-bromo-2-deoxyuridine (BrdU) is a pyrimidine analog. It gets incorporated into the newly synthesized DNA of proliferating cells in place of thymidine. 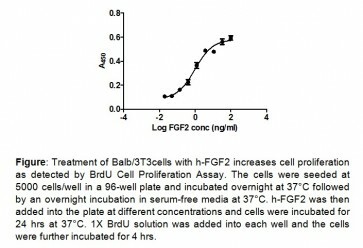 Biovision's BrdU Cell Proliferation Assay Kit detects incorporated BrdU using a mouse anti-BrdU antibody. An anti-mouse HRP-linked secondary antibody is used to detect the anti-BrdU antibody bound to BrdU, which is followed by addition of TMB (a HRP substrate). The extent of color development is proportional to the quantity of BrdU incorporated into the cells and can be used directly as an indicator of cell proliferation. 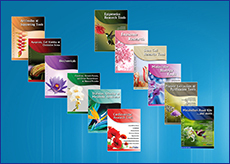 Compared to other cell proliferation assays, this kit detects only the proliferating cells and not the seeded cells. This highly sensitive, non-radioactive kit detects as less as 50-100 proliferating cells. My data shows huge variations. What could be the reason? Huge variations can be caused by the nature of the cells. For example, increment in cell numbers following lymphocyte stimulation can lead to cluster formation, this effect can disturb the antibody recognition and thereby underestimate the response. What is causing a high background in my samples? High background is cause by insufficient washing. Increase the number of washing steps or prolong incubation with wash buffer upto 5 min per rinse. Chen, Si-Le et al. (2016) Targeting CRMP‑4 by lentivirus‑mediated RNA interference inhibits SW480 cell proliferation and colorectal cancer growth, Exp Ther Med. 2016 Oct;12(4):2003-2008.